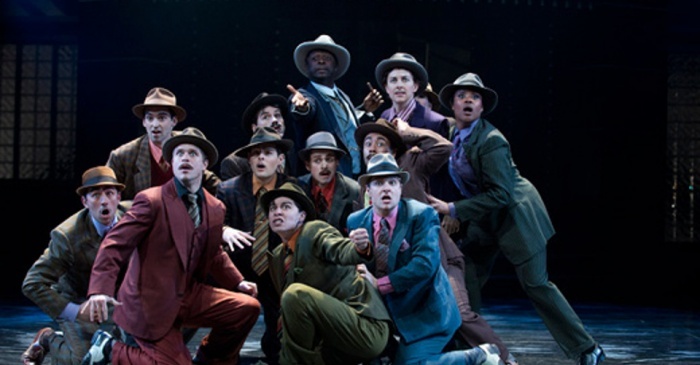 Everyone knows that Guys and Dolls is a great American musical, but more often than not productions of it are disappointing – cartoonishly overstated, terminally cute, or generally misguided (which is the word I’d use to describe Joseph L. Mankiewicz’s 1955 movie version). The 1992 Broadway revival was a popular and critical hit, but I didn’t derive much pleasure from it: the cast, headed by Nathan Lane and Faith Prince, seemed to be working way too hard, the staging was uninventive, and the tempo of Frank Loesser’s songs was slowed down, as if on the assumption that the audience couldn’t otherwise keep up with the witty lyrics. Oddly, amateur mountings of the show often locate its vaudevillian spirit and its robust style – phantasmagorical (the Damon Runyonland milieu) but with a strong underpinning of romantic feeling – better than professional ones, which tend to substitute slickness for charm. But Tadeusz Bradecki’s production at the Shaw Festival in Niagara-on-the-Lake, Ontario, is expertly staged and choreographed (by Parker Esse) and vastly entertaining. It gets the balance right: it’s raffish without pandering, open-hearted but not sentimental. The show takes a little while to kick in. “Runyonland,” the instrumental ensemble number that Loesser supplied in place of an overture, begins intriguingly with silhouettes behind the scrim, but when that scrim flies up to reveal Peter Hartwell’s set, a semi-abstract black-and-white cityscape of midtown Manhattan, your heart sinks – not because it’s monochromatic (Sue LePage’s colorful costumes play vibrantly against it) but because it’s ugly. And, as usual, the company isn’t large enough to fill the huge Festival stage, so the number doesn’t do what it was written to do, set the mood and style of Runyon’s bustling, eccentric world of gamblers and minor-league show-biz pros and street hustlers (as adapted by book writers Jo Swerling and Abe Burrows) – even with Shaw veteran Guy Bannerman exiting as a gesticulating blind man and then reappearing a moment later as a pretzel vendor. In the first dialogue exchange, among the goofball gamblers Nicely-Nicely Johnson (Thom Allison) and Benny Southstreet (Billy Lake) and the vigilant cop Lieutenant Brannigan (Bannerman again), the actors seem to have been directed to act like Loony Tunes figures. Shawn Wright is a full-sized comedian; when his Nathan is perplexed or caught out, his big, square face freezes and he looks like Boris Karloff as Frankenstein’s Monster. 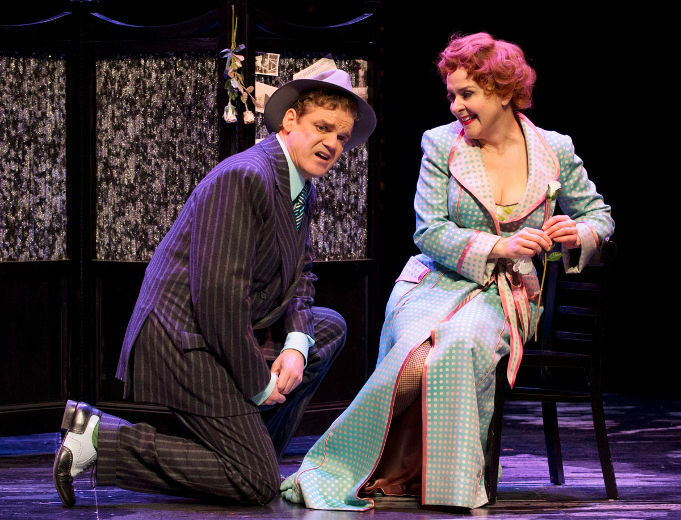 Opposite him, redhead Jenny L. Wright has a diminutive vibrancy, like Bernadette Peters playing Betty Boop, and a burlesque-house stylized sexiness that I’ve never seen in Adelaide before, though once you’ve seen the role played this way it seems like a natural approach. A confident singer and dancer, she’s sensational on “Adelaide’s Lament,” delectable in the two Hot Box numbers. (Esse does a fine job arranging the dances for both, but it might have been better not to make “A Bushel and a Peck” a striptease, since it steals the thunder from the later “Take Back Your Mink.”) And when she raises the volume and leaps into a higher register to underscore her disdain whenever the mentions Nathan’s crap game, her ferocity makes for a good running gag. These two duet on “Sue Me” late in act two, and they sound wonderful together; here’s one Nathan who can really sing. The Nathan-Adelaide plot tends to work better in productions of the musical (when it isn’t over the top) than the Sky-Sarah romance. That’s the tricky one: you can’t blame Swerling and Burrows, who give the actors plenty to work with, but it usually comes across as insipid – perhaps because of the temptation to cast an operetta soprano as Sarah. Gillett doesn’t fit that description; if anything, her voice is a trifle shrill. But she doesn’t act the role especially well. At the outset she comes across as whiny and ineffectual, and then, when she has to duke it out with Sky, she’s assertive enough but her line readings are an emotional wash. She doesn’t have the precision to make a line like “I’m a mission doll” – the first-act curtain, in answer to Sky’s “What the hell kind of doll are you?” – work the way it has to. Her strong suit turns out to be her dancing (in the Havana club number). Kyle Blair is rather refined for Sky; the Runyon jargon doesn’t sound quite right in his mouth. But he sings the part beautifully and he acts it with so much feeling that the vocal fastidiousness turns into a quirk instead of an obstacle. On “I’ll Know,” Sky’s first duet with Sarah, Blair shows us the character falling for her even while he thinks he’s holding out, and his surprise at what he’s starting to feel. And his “Luck Be a Lady” is superb. Allison isn’t the right actor for Nicely-Nicely Johnson, but even his hambone gesticulating doesn’t spoil “Sit Down, You’re Rockin’ the Boat”; the ensemble singing and the choreography restore its status as a bona fide showstopper. (Loesser’s score is truly ageless.) As the Salvation Army general, Matilda Cartwright, Patty Jamieson is also a bit much. But I enjoyed David Ball as the mobster Joey Biltmore and especially Aadin Church as a soul-man Big Jule. And Peter Millard does an amazing amount with the role of Arvide, Sarah’s uncle and Salvation Army colleague. The character rarely attracts much notice; Millard gives it both wryness and tenderness, and his craggy voice sounds inexpressibly sweet on “More I Cannot Wish You.” That’s the second-act song no one pays much attention to, amid “Take Back Your Mink,” “Luck Be a Lady,” “Sue Me,” “Sit Down” and “Marry the Man Today.” (Guys and Dolls is that rare musical whose second act is even better than the first.) Millard reminds us what a lovely ballad it is – that the score contains no throwaway tunes. “More I Cannot Wish You” turns out to be one of the evening’s highlights, and Millard its nicest surprise. 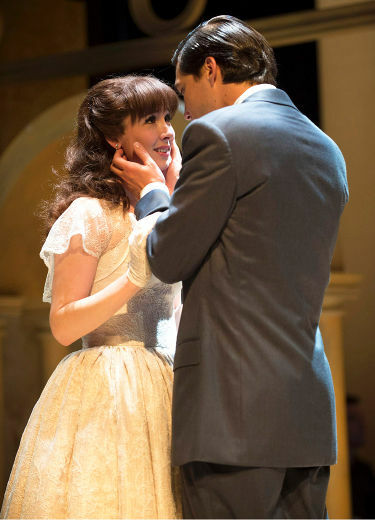 The festival’s other musical, Adam Guettel and Craig Lucas’s The Light in the Piazza, is playing at the intimate Court House Theatre. That was an ideal space for Guettel’s Floyd Collins some years back, but Piazza is about the process of opening up – to romance, to the world – and it feels constricted here – though musical director Paul Sportelli and his half-dozen fellow musicians convey the rhapsodic quality of Guettel’s score.. (In Floyd Collins title character is trapped in a mine throughout the musical; its subject is the tension between physical limitations and the freedom of the imagination.) At Lincoln Center, where the work had its Broadway premiere in 2005, the expansiveness of Bartlett Sher’s staging and Michael Yeargan’s set worked in tandem with Guettel’s rapturous, towering melodies (especially the lovers’ songs, “The Beauty Is,” “Passeggiata,” “Love to Me” and the title number) to underscore the idea of giving yourself over to love. The plot, which Lucas adapted from an Elizabeth Spencer novella, is about the journey two American southerners, Margaret Johnson (Patty Jamieson) and her daughter Clara (Jacqueline Thair), take to Florence in the summer of 1953, where Clara falls in love with a Florentine, Fabrizio Naccarelli (Jeff Irving). But though it isn’t immediately apparent, Clara’s psychological growth was hampered when she was kicked by a pony at the age of twelve, and her mother has continued to play the role of her guardian, interceding whenever young men show a romantic interest in her. But faced with Clara and Fabrizio’s passion for one another, Margaret begins to reconsider what her kind of life her daughter might be capable of leading, and to wonder if her protective impulses might after all be a disservice to Clara. The musical juxtaposes the idealistic, boundary-crossing love of the young people with the troubled marriages of Fabrizio’s womanizing older brother Giuseppe (Kelly Wong) and Franca (Kaylee Harwood), Fabrizio’s parents (Juan Chioran and Julain Molnar), and especially Margaret and Roy (Shawn Wright), who has stayed behind in Winston-Salem for business reasons (he’s in tobacco) but also, the book implies, because he is emotionally distanced from his wife. In the course of the musical Margaret has to reach beyond her own romantic disappointment to see a happier road for her daughter, whatever the obstacles. As Sher has said, the idea at the heart of the musical is that we have to leap recklessly at love when it presents itself because there are always obstacles, always reasons to hold back. It’s a glorious show, and at the Shaw it survives the space constraints, Jay Turvey’s often awkward staging, Michael Gianfrancesco’s set pieces (which keep getting in the way), the clunky choreography by Linda Garneau, and even some problems in the casting. Thair is certainly the right singer for Clara, but her acting is tepid. Jamieson labors diligently to stretch to the role of Margaret (no doubt it helps that she’s played it before), but though she can hit the notes – no mean feat – her singing isn’t very expressive; she strives to compensate with the tremulous intensity of her acting, which often works for her. At first I was put off by her mannerisms, but they help her get at the emotions in the songs, especially “Dividing Day” (which is about the failure of her marriage) and “Fable,” the finale (where she overcomes her cynicism about love). “Dividing Day” follows the first of two phone conversations between Margaret and Roy – it’s the scene that shows Jamieson’s acting at its best – and Turvey keeps him on stage, dressing for a business dinner, through the first verse, while Margaret reaches out uselessly for him. The literal distance between them, who are half a world away from each other, becomes a metaphor for the emotional detachment on his side that has frozen their relationship. Jeff Irving is utterly charming as the lovestruck Fabrizio, and he’s the only one of the three leads who has both the singing and the acting chops to meet the stringent demands of the role. The supporting cast is strong, though: Wong as the clownish, immature brother; Harwood as his wife, whose awareness of his cheating has made her desperate; Molnar as the long-suffering Signora Naccarelli, who is spotlighted in the second-act opening, “Aituami” (a silly number that is justified here by Molnar’s performance); and especially Chioran as Fabrizio’s complicated papa. Guettel wrote one of his loveliest songs, “Let’s Walk,” as a duet for Margaret and Signor Naccarelli, and it’s one of the production’s high points. But this Light in the Piazza is most memorable for Irving’s ecstatic renditions of “Il Mondo Era Vuoto” and “Passeggiata” in the first act and “Love to Me” in the second. These are the moments when it comes closest to fulfilling the intentions of its creators.